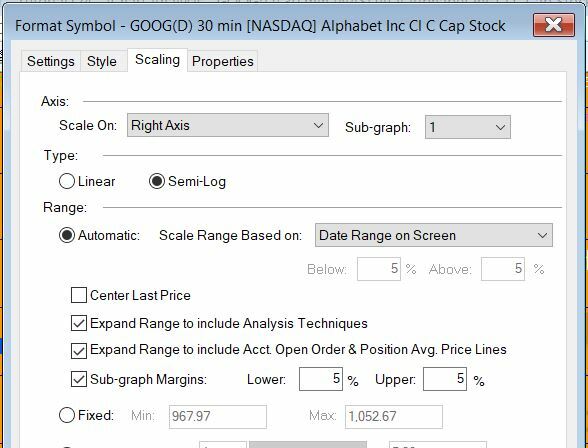 You may have noticed that when you apply a text label to a chart at a specific price, perhaps something below or above a bar, and then scroll the chart, that the distance between the drawing object and the bar changes. The image shows two screen captures from the same chart. As the chart is scrolled the scale is compressed and the same text label moves closer to the bar (in pixel terms) on the right. This occurs when the range in Format – Symbol – Scaling is set to automatic, date range on screen. See image below. A Gold Pass member asked how it might be possible to make labels stay a fixed number of pixels from a bar (rather than a fixed price difference). This may seem like a somewhat esoteric question, BUT it does provide several interesting lessons in the use of drawing objects, the charting host object, the timer, collections, other things that you may be able to apply in other programs. The tutorial program is available for download and, additionally, Gold Pass members have access to a bonus video. When first applied to a chart, _Tutorial124 measures the difference between the high and the low of chart and also the height of the chart in pixels. It then calculates a ratio equal to the height of the chart divided by the price difference. The program searches for Hammer candlestick patterns, when it find one it draws a text label 4 ticks price difference below the low of the pattern. The text label takes the price level of the label, converted to a string. The program then looks for the client window being resized or the chart being scrolled. If either occur the height of the chart divided by the price difference ratio is recalculated and passed as an input to a method (MoveText). Each time this method is called it copies all the text label objects into a vector and then for each text label it ascertains which bar it is applied to and then re-positions the text based on the relationship between the original height/price difference ratio and that which has been recalculated to ensure that the pixel difference remains the same. It also updates the text label string to reflect its new position. The resizing of the chart is detected by an event handler in the charting host object. 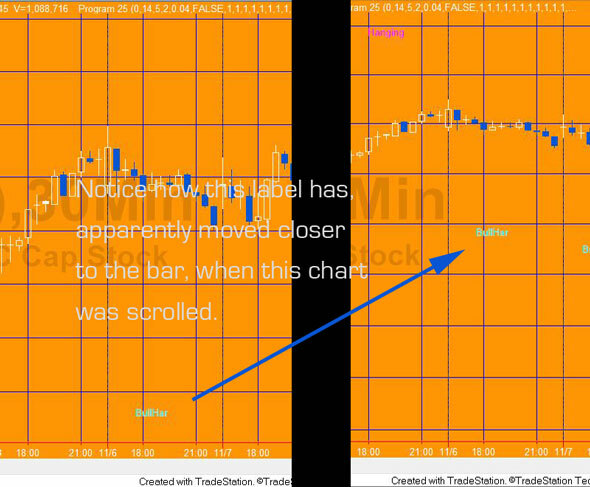 As of TradeStation version 9.5, there is no event handler to detect if a chart has been scrolled. In this case we monitor the value of the leftmost display date time. This is done every tick and using a timer that is set to fire every 500 milli-seconds. Note: this ensures that the LastLeftVal is set up correctly when the program is initialized. If you wish to save yourself some time typing in the code for _Tutorial124, the UNPROTECTED TradeStation indicator ( _Tutorial124) containing tutorial program (i.e. the TradeStation EasyLanguage is fully functional and you can see the source code) is available for IMMEDIATE download for $19.95- by clicking the ‘add to cart’ button. The program works with TradeStation but, unfortunately, not with MultiCharts. Another issue that can cause what appear to be spurious results are the ‘Show empty daily trading periods for traditional chart types’ and ‘Show empty intraday session periods for traditional chart types’ settings. If these are selected, the chart includes blank bars which ‘confuse’ the bar number for BNPoints. For example, in the following daily chart of IBM, the ‘Show empty daily trading periods for traditional chart types’ is selected. Make sure that you are logged in to view the following bonus video in which I describe, in more detail, how we get and set data in the Text label objects. Please let me know if you spot any bugs or errors.